An organized bathroom saves you time and money. No more digging through cabinets to find the one thing you need when you are in a rush. No more buying an extra because you didn't remember you already have three under the sink. No more wishing you had more space in your jumble of beauty products. 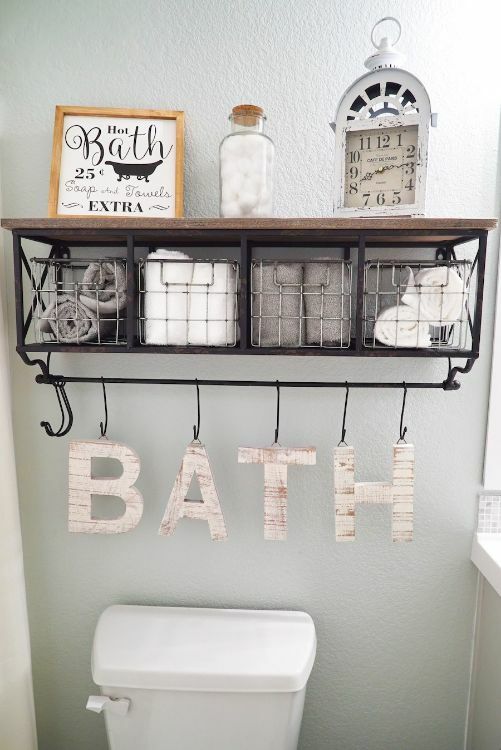 All you need is one afternoon of free time and some inexpensive items to create an organized bathroom. These bathroom organizational ideas will transform your bathroom into a nicely organized space. The dollar store is an excellent source for cheap organizing items. 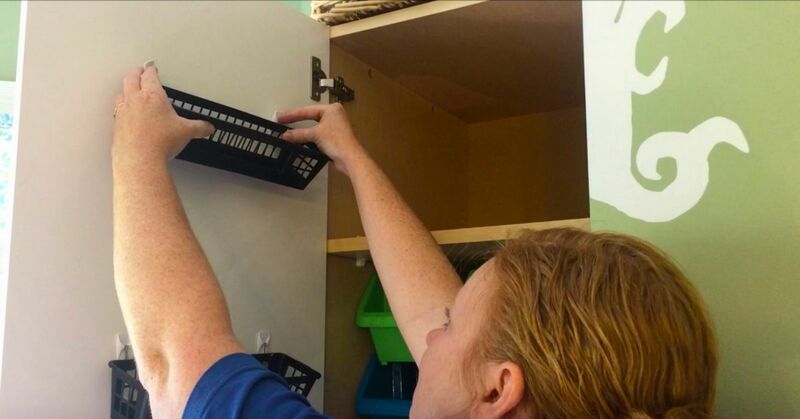 Plastic baskets combine with Command hooks to make use of the vertical space on cabinet doors. Other containers and baskets can be used in creative ways to organize all your bathroom items. If you can't find a color you like, spend a bit of time to use spray paint to give the containers the look you are looking for. The area above the toilet is often just wasted space. You can often find cute shelves like this one at craft store at a fraction of the cost by using a store coupon or watching for sales. The baskets are perfect for holding extra hand towels, soaps, and other bathroom items. 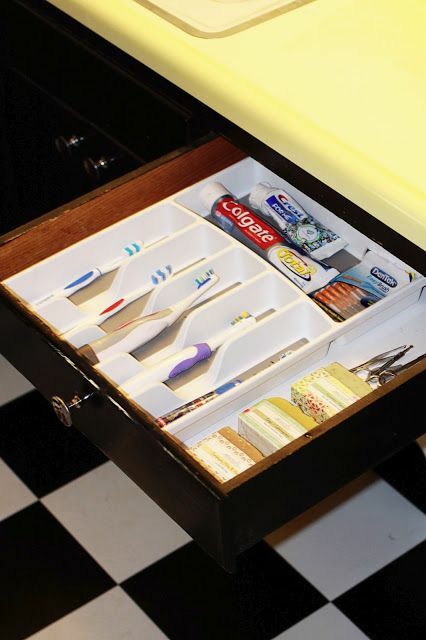 A kitchen utensil tray is the perfect way to stash your toothbrushes and other dental care items neatly away in a bathroom drawer. Each toothbrush stays confined to its own space - keeping germs from spreading. Pulling it out for a quick run through the dishwasher on a regular basis is all you need to keep it nice and clean. Digging through products is awful. You knock things over and make a mess. Use a Lazy Susan to add easy access to all your products. Instead of digging through, you simply spin it around to find what you need. As an added bonus, it is also easy to wipe clean in case something spills. 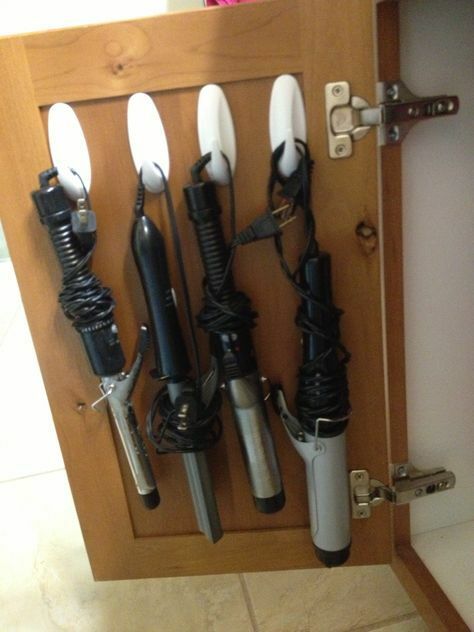 Use the space inside a cabinet to hang up your hair styling tools. Many heat tools feature a hook on their base for just this purpose. No more dealing with tangled cords with this method. Everything stays organized and easy to retrieve. Mason jars are a cute way to store the small items you use on a daily basis. 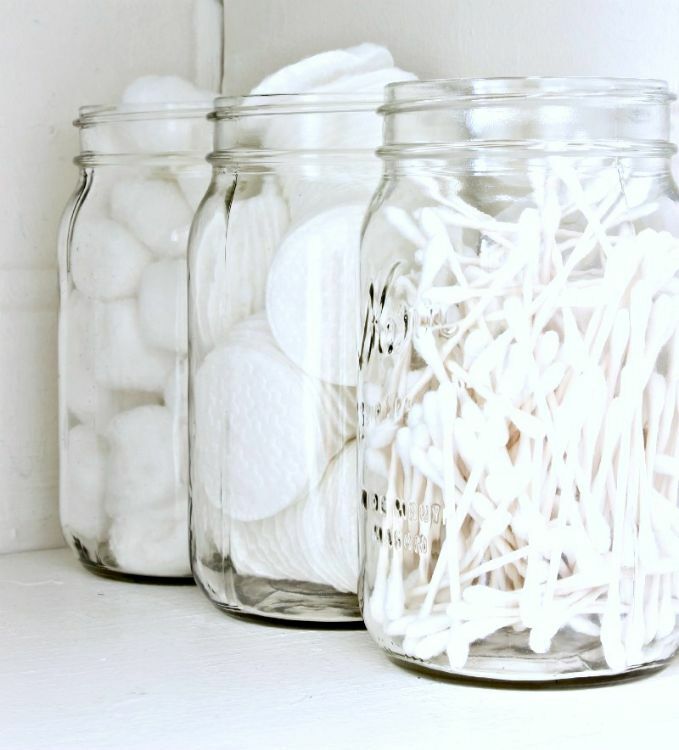 Cotton swabs, cotton pads, flossers and other items can be kept neatly and accessible by using glass jars. Don't feel the need to purchase jars. Spaghetti sauce, pickles and other food products often come in attractive jars you can reuse. The space behind your bathroom door is just wasted space. Unless you use this creative idea to reclaim it. 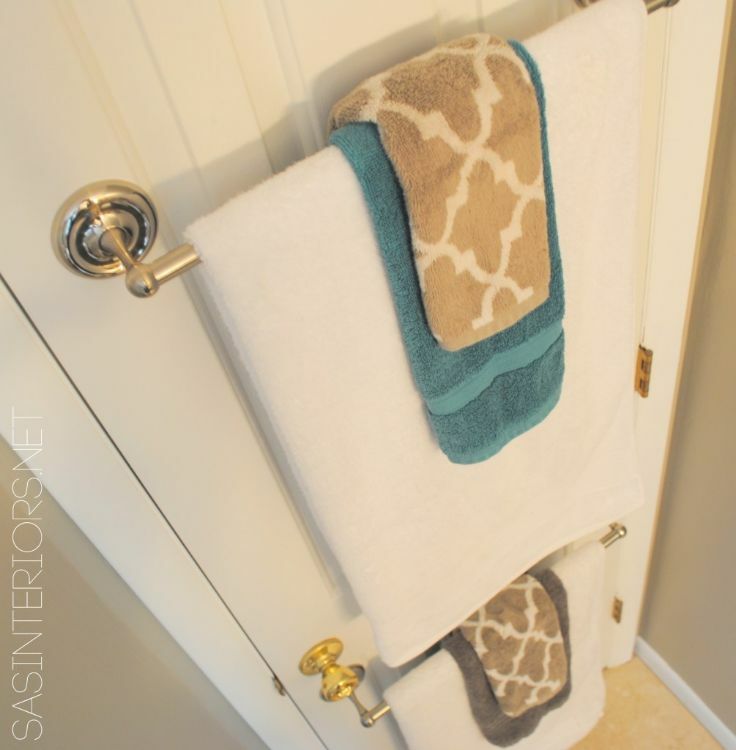 Hang towel racks on the back of your bathroom door. If your doors are not solid, make sure you use the proper anchoring to protect the doors. One hanging shower caddy isn't enough for many families. When everyone uses different products, the shower becomes quickly cluttered. 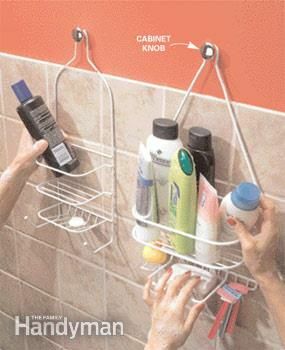 Use cabinet knobs to hang extra shower caddies in your bathroom. Everyone can even have their own caddy with this clever idea!